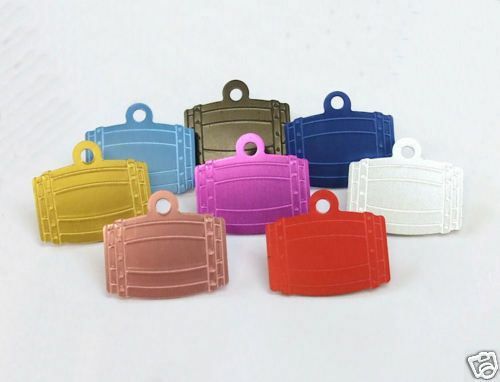 All our high quality pet tags have a superior finish, no bare aluminium edges. Manufactured using Alcoa aluminium, anodised to 7 microns including the edges. All our tags come with a split ring to allow easy fixing to your pets collar. This large barrel tag measures approx. 35mm x 25mm x 1mm. Available in 8 colours, Silver, Gold, Light Blue, Dark Blue, Red, Pink, Purple and Black. Engraving on the front 1 line of 11 Characters including spaces. Engraving on the back 4 lines of 15 characters per line including spaces.